The picture I've been too ashamed to show you. Every day I watch the news, and everyday it becomes more and more clear to me as to WHY women have body image issues. When a nominee for the President of the United States of America can get away with flippant misogyny, sexism, harassment and blatant objectification of women on the political platform... well, it makes me mad. She's a 4. Miss Piggy. Such a Nasty Woman. And I won't even say the most offensive comment... you know the one. I've worked REALLY HARD in the past few years to see my body as more than the sum of its "imperfect" parts. I've practiced, actually PRACTICED looking at my naked body in the mirror, staring, until what I saw before me normalized and I could see my body as whole. I've come SO FAR in the past couple of years, but sometimes it's still hard. Just this summer my husband took a picture of me at the beach that sent me into a completely unexpected body-shaming tail spin. I thought I was past that nonsense. I internalized all the garbage we hear about our bodies, and I let it paralyze me. I cancelled date night. I hid in a cover-up for a few days. I didn't play with my kids. I shared my anger, sadness and shame with my husband, and do you know what he said? "No wonder you feel the way you do, sweetie. The only women I saw walking on the beach this week without a cover-up on were tall, slender, muscular women. Where in hell was everybody else? I'll tell you where they were. Sitting in their beach chairs, hiding their bodies!" It was true. WHERE WAS EVERYBODY ELSE? I got back in my suit before our vacation was over, but when I did, I was inhibited. I tried like hell not to be, but it was hard. The how-to-have-a-beach-body societal pressure has always made me bristle. I want to believe that I am stronger than any societal message, but sometimes, when I'm feeling open and free and vulnerable, I get gob-smacked and I crash into a puddle of self-deprecating tears. And I believe every slanderous comment and magazine headline that says my body is not beautiful enough. Except right now, I don't feel myself weakening with every nasty comment I hear on TV, I feel myself gaining STRENGTH. So today, I'm taking that picture that I've been too ashamed to show anybody, and I'm putting it on the damn internet, and saying... YOU MIGHT THINK I'M A 4, BUT MY BEAUTY CANNOT BE MEASURED ON YOUR MISOGYNISTIC-SEXIST SCALE. IT'S TOO BIG FOR THAT. I'm not gonna lie, I had to look long and hard at this picture to see my beauty. It was hard for me to look past the cellulite on my thighs to see my gentle smile, my relaxed shoulders, and that smokin' hot pink bathing suit I'm wearing! The longer I stared, the more I saw. My dignity. My brave. My strength. My fierce. My happy. My kids. My beauty. And I can see YOU too. Listen gals, the ONLY WAY we are going to start seeing ourselves as normal, is if we reclaim ourselves. If we say... NO WAY BUDDY, YOU WILL NOT TALK TO ME THAT WAY! We cannot hide. We cannot sulk. We cannot forsake our collective power as women because we are afraid. We must STAND UP and reclaim OUR BODIES. We must STAND UP to the rhetoric, and say NO MAS. We must STAND UP to the bullies and say, HERE I AM. I just finished up the most recent round of Stasia's Style School, and I'm so incredibly proud to say that there are literally DOZENS more women in the world, STANDING UP and saying, I WILL NOT HIDE ANY LONGER. 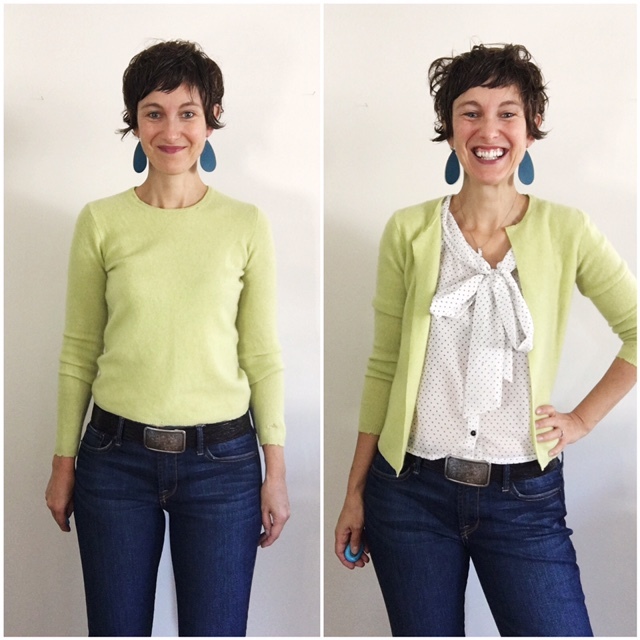 Meet Jennifer, Style Sister (and total fire cracker of awesome) from the latest round of SSS, and read what she has to say about reclaiming HER body! 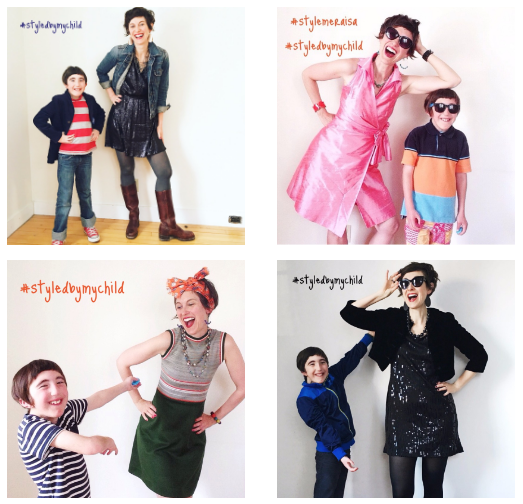 "Before Style School, my default clothing choices were all about trying to hide my “problem areas” by dressing in long tops and dark colors, basically trying to be invisible. After seeing my photos every day in Style School, it was so clear that trying to hide those areas just didn’t work – more often than not it actually emphasized what I was trying to hide! So, despite my great resistance to it, as a Style School experiment, and in that safe space with the Style Sisters, I gave up trying to hide. 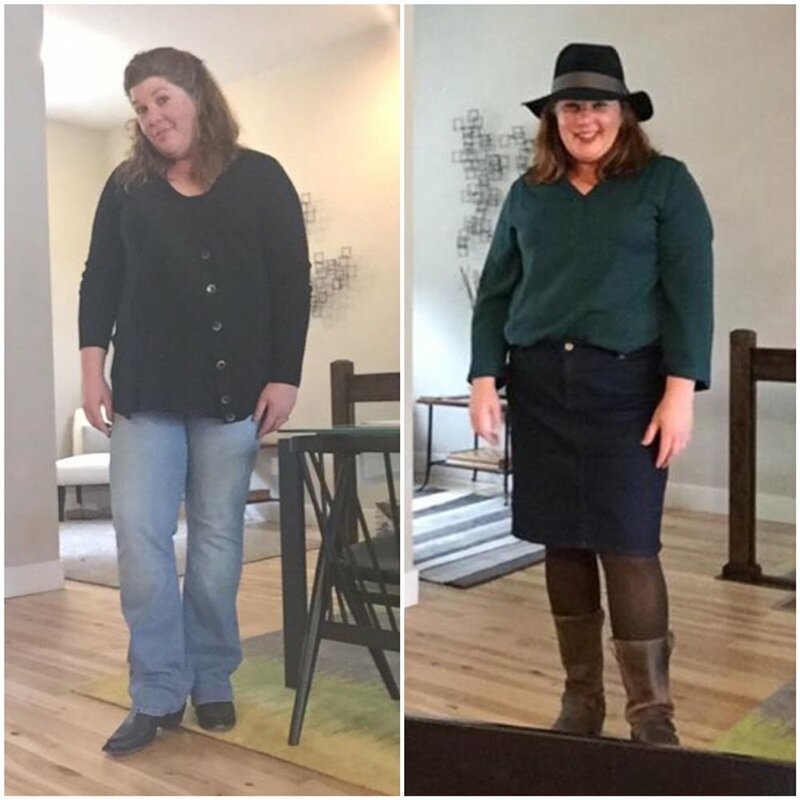 It’s been an amazing mental shift to give up dressing from a place of shame and hiding and instead moving into a place of celebrating what I love, and who I am on the inside. I feel so much brighter and lighter, and more engaged in the world – more confident. It’s like I let go of a burden that I didn’t even know I was carrying. It’s been a much deeper and more meaningful change than I would have ever expected. 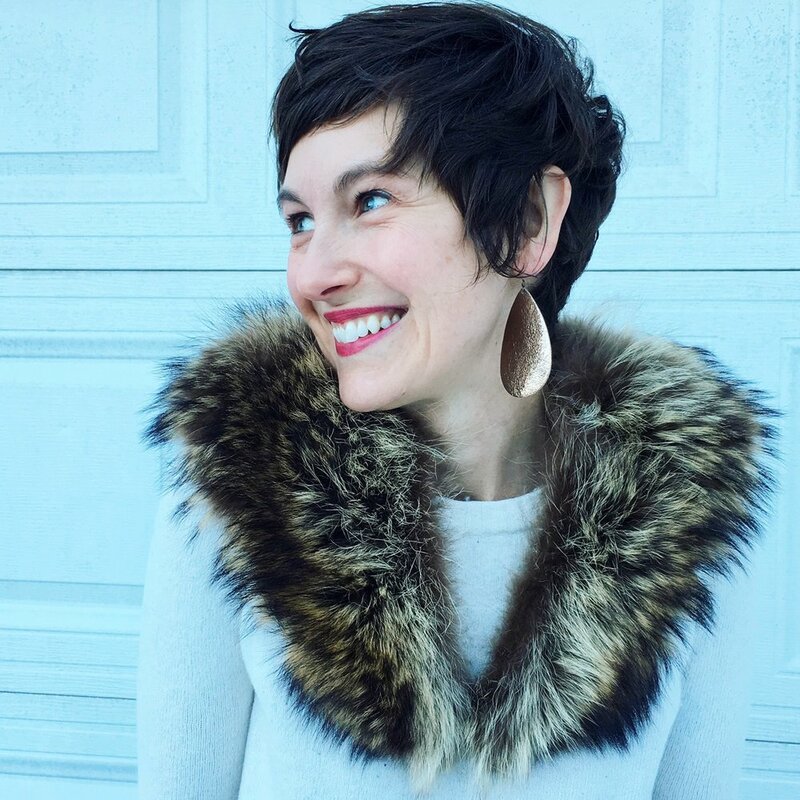 Style School is so much more than the usual style "guides" - Stasia gives us the tools and the safe space to learn how to figure out how to let our best selves shine, inside and out." Jennifer G.
Right now is the PERFECT time to RECLAIM YOU! Put on your shorts and your mini skirts. FREE YOUR KNEES. And your arms. And your belly! How in hell are we EVER going to normalize ALL WOMEN'S BODIES, if every perceived imperfection under the sun is being covered up and hidden from sight?? It starts with me. And with you. If the thought of it gives you heart palpitations. Good. Do it anyway. I'll be doing it alongside you! PS. If you're interested in signing up for the next round of Stasia's Style School, click HERE to get your name on the list! When Tweaks are not Enough, it's time for Transformation. "When tweaks are not enough, it's time for TRANSFORMATION." Yea, of course. But what about STYLE? I know a lot of you are stuck in tweak-phase. Making little adjustments here and there. Trying to shop, but getting frustrated because you're not sure WHAT in heck to buy. Another pair of earrings? A new shade of red lipstick? A denim jacket? You've done tons of tweaking, but you STILL feel like your clothes don't represent your YOU-NESS. You're still not happy with your body. You're focusing on your growing belly, your mama-stretch-marks and the cellulite on your thighs. BRAVE... that is something you know is INSIDE you, but right now, you're feeling kind of like a whimpy-pants. There comes a point when you've got to STOP TWEAKING & START TRANSFORMING. Unless you have all three of those things, tweaks aren't gonna do you diddly. Tweaks happen on the outside. Transformation happens on the INSIDE! 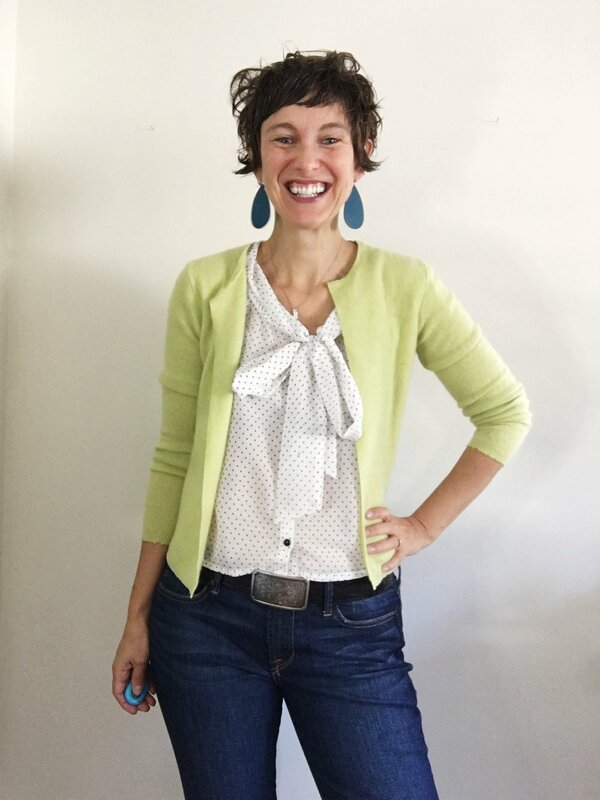 Right before my husband and I left left for the Peace Corps, we did a photo shoot with a local photographer, and THIS IS WHAT I WORE. I didn't have a CLUE about Inside-Out Congruency at the time, and this outfit is testament to that. It in NO WAY reflected my SOUL-FIRE! That thing that I was doing there... trying to hide my hips and thighs because I was ashamed of my body - NOT WORKING!! And you see those curved-in, lacking-confidence shoulders? Though I was doing something BRAVE (joining the Peace Corps) I wasn't feeling the POWER of my decision. 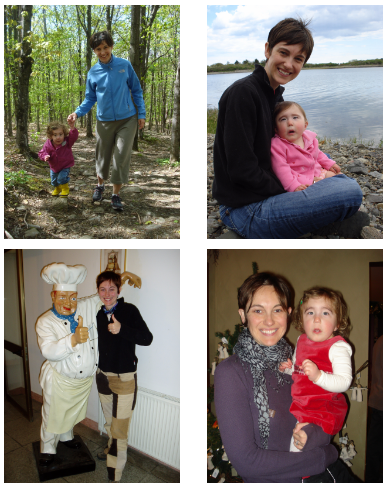 I approached big change with a little bit of grit... and HUGE amount of trepidation. STYLE is something I LEARNED. I spent years tweaking, trying on different kinds of oversized drawstring pants and hippy pendants. And like a true science-gal (my background is in Ecology) I realized a new methodology was needed. So I invented one, and things changed. Here's a side-by-side, to bring it all home. Believe it or not... I was around 15 pounds lighter in the BEFORE picture. THIS is why I started Stasia's Style School. 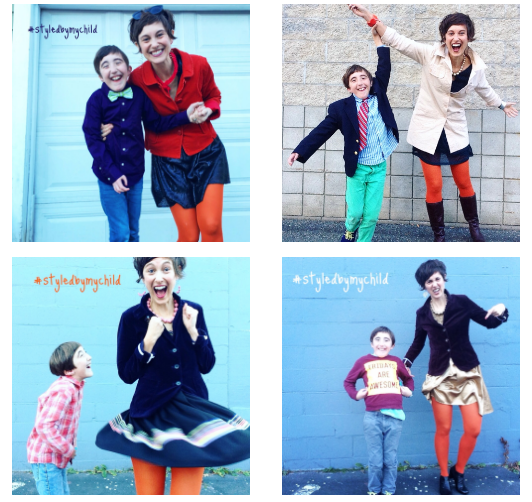 And this is PRECISELY WHY Style School is not about TWEAKS... it's about TRANSFORMATION. During the last round of SSS, TRANSFORMATION was the name of the game. One of our #stylesisters, Michelle, transformed into a mighty force right before our very eyes, and it was A-W-E-S-O-M-E.
"If I’m really being honest, when I look at these photos, I just see the before side. And I cringe. Seriously. The hair. It’s all I see. Realistically I know you’re looking at both photos... and I’m pretty much hoping you’re looking at the after side far more. So, I’m sitting here trying to get over myself and not dwell on the fact that I’m letting the whole world see something completely unflattering. Nothing like testing my capacity to be real! What you see when you look at the photos is clothing changes and a new haircut. But the transformation is much bigger than that. You might see it in my eyes and smile. It was soul deep. It’s lessons learned about who I am. About what I was and what I no longer choose to be. It’s about bravery and laughter in the deepest parts. And it’s about community, confidence and caring – both about others and myself. Wait, you didn’t think Style School could do all that? Well, neither did I. It was the best investment I've made in myself in a long, long time. I’m not sure I could say Style School changed my life. But it did transform me. And I’m the author of that life." So let me ask you... are YOU ready for TRANSFORMATION? UPDATE: The winter 2016 of Stasia's Style School SOLD OUT in 24 hours. Keep your eyes peeled for the spring 2016 launch! It's time to WEAR YOUR SHINE. How to Wear Jeans + a T-shirt and still look CUTE! I'm a jeans and t-shirt gal. Always have been. Probably always will be. In the past, before I figured out this whole style 'thang, my jeans and t-shirt look was... simple. It was comfortable, but it sure wasn't cute. Comfortable used to be my litmus. The ONLY factor I considered when getting dressed. Then I discovered Inside-Out Congruency, and realized I was selling myself short. OF COURSE I WANT TO BE COMFORTABLE. I'm NOT a fan of pants that make my crotch hurt when I sit down, or shirts that I have to keep tugging on because the booby darts are fitting me in the wrong place. So may I present to you my latest jeans and t-shirt combo, that is comfortable AND cute! I'm wearing one of my FAV (comfy) t-shirts that I thrifted this summer. It HAD a crewneck... until I ripped the neck out and made it a wee bit more edgy. Then I paired it with a (comfortable) fitted black blazer, sleeves rolled and collar popped, and slipped on my faaavorite no-muffin-top-here J.crew bootcut jeans. I accessorized with a long necklace and a pair of my favorite Nickel & Suede earrings, but something was off. There was a lack of harmony between the tear drop shape of the earrings and the looooong necklace, so I swapped out the N&S earrings for these looooong Kerin Rose Galaxy Earrings and knew immediately I had a winner! The long line of the necklace needed an accompanying long line. But something was still off, so I studied my look in the mirror for a second and realized aha - the neckline on the tee was a little low and missed my high balance point (read HERE if you don't know what I'm talking about), so I layered on another necklace and voila... PERFECT! I felt bold, confident, edgy and a little mysterious all day. ;) Oh, and comfortable. Now do me a favor and scan over my outfit description above, noticing ONLY THE HIGHLIGHTED WORDS. Style begins on the INSIDE, we all know that - but it's the little details of how we put things together on the outside that pull it all together. If you're feeling wicked brave, show me YOUR BEST jeans and t-shirt look over on FB or Instagram and tag me! !